Police allowed animal rights activists to attack a fur farm causing thousands of mink to be released into the countryside, it has emerged. The raid in Crow Hill Farm near Ringwood in 1998 was carried out by a group which had been infiltrated by the Metropolitan Police, the force said. It said its actions had "impacted" on the Hampshire police investigation. No charges were ever brought over the attack in which up to 6,000 mink were set free. Many of the predators were killed to protect pets and livestock. An undercover officer, using the name Christine Green, took part in the raid which was carried out by members of the Animal Liberation Front (ALF), police said. Her cover name has been revealed by the public inquiry into undercover policing, which was launched by the government in 2015. The true identity of the officer, who has since resigned from Scotland Yard's Special Demonstration Squad (SDS), cannot be revealed for legal reasons. 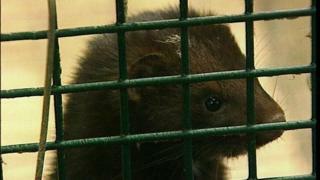 The Metropolitan Police said the scale of the mink release had been "unforeseen" by senior officers. Assistant Commissioner Helen Ball said: "It appears that the SDS allowed this incident to go ahead, as they saw it, in the interests of preventing more serious crime in the longer term. "I would like to be clear that the decision-making surrounding this incident would simply not happen in today's Metropolitan Police Service." Ms Ball said Hampshire Constabulary was not told until 2014 about the undercover officer's involvement. She said: "The Metropolitan Police Service has apologised to Hampshire Constabulary for the impact these decisions had on their ability to bring those responsible to justice." The Hampshire force said it had reopened the case in 2014 but could not bring charges due to a "lack of tangible evidence and no suspects being identified". Undercover police inquiry: Can it get to the truth?